1. Lecturer in Audiology - Rs. `47,000/- p.m.
2. Lecturer in Special Education - Rs. `47,000/- p.m.
3. Clinical Linguist - Rs. ` 32,000/- p.m.
4. Software Engineer - Rs. `42,000/- p.m.
5. Occupational Therapist - Rs. 30,000/- p.m.
6. Copy Writer - Rs. 16,000/- p.m.
7. 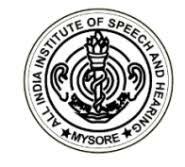 Speech & Hearing Technician / Assistant - Rs. 22,000/- p.m.
8. Junior Research Fellow - Rs. `25,000/- p.m.
9. Data Entry Operator - Rs. `12,000/- p.m.